Russian President Vladimir Putin (L) and China's President Xi Jinping (R) chat at the Asia-Pacific Economic Cooperation (APEC) Summit in Lima, Peru, Nov. 19, 2016. Donald Trump’s victory is consistent with the will of the American people for the last forty years and longer: whether Republican or Democrat, the outsider almost always wins. A peanut farmer from Georgia came out of nowhere to become President of the United States. Four years later, that peanut farmer defeated the money and power of the Kennedy dynasty and then himself lost to a movie actor from California. In a rare exception to the rule, George H.W. Bush succeeded Ronald Reagan but then served only one term, defeated by an outsider, who grew up poor in the all but politically powerless state of Arkansas. Then there was the skinny first-term Senator with a funny name who challenged the mighty incumbents’ machine, and wealth and power, and became the first minority president in the history of the United States. It is all straight out of a Frank Capra movie. And so today we have another outsider–and people from New York know that anyone from Queens will always think of himself as an outsider–an outsider who, according to the latest FEC filings, was outspent two to one by Hillary Clinton, and won. Donald Trump first beat the entire organized Republican Party to win the nomination, and then he beat the Democratic Party machine to win the election. As an outsider. As Chris Matthews said last night on MSNBC, in every tweet he sent, every speech he made, Donald Trump was saying, “I’m not one of them.” I’m not one of the insiders. And he won. But this is not surprising. This is how American democracy works. The American people don’t trust the bankers and the rich and powerful people in Los Angeles and New York and yes, Washington DC. So the American people throw them out. Regularly. And that is exactly what those who founded this democracy wanted. So this is how you explain Donald Trump to the world. In a democracy, the people can prefer a peanut farmer to a rich heir favored by insiders. In a democracy, the people can prefer a poor boy from a small town in Arkansas to a rich heir favored by insiders. In a democracy, the people can prefer a young African American to candidates with far more wealth and power. Then there is the Electoral College: how to explain that to the world? You explain it by saying that it was the genius of the founders of this Republic to create a system of checks and balances, so the rich bankers and billionaires and yes, the media, could not rule absent the will of the people. So as part of those checks and balances we have the Electoral College. It obligates those who seek national office to go to West Virginia and Iowa, to Wisconsin and New Mexico, places the billionaires and the media might never otherwise visit. That is why in America the underdog can win. That is how a free democracy works. That is not how it works in Russia, where Vladimir Putin has his political opponents murdered in the streets. That is not how it works in China, where democratically elected dissidents are barred from taking office, and dissidents are kidnapped from other countries and forcefully returned to face torture, prison and worse. That is not how it works in Cuba, where for 50 years Fidel Castro sent thousands to firing squads and where today dissidents are jailed and beaten, including the Women in White. But what of the new President’s policies: how to explain these to the world? Here again we must reach outside of this building, this city, this part of the country, where so few support him. Nothing resonated as much with Trump’s supporters as trade, opposition to global trade. Global trade lifted hundreds of millions of people out of poverty in Asia and Africa, an historic achievement. And it benefited us, in this building, in this city and this part of the country. But that rising tide did not lift all boats: it did not benefit millions of our fellow Americans, in West Virginia and Iowa, in Wisconsin and New Mexico, who lost their jobs to pay for our prosperity. We need to explain to the world why millions of our fellow Americans, who people around the world rarely see in Hollywood movies or on CNN, rose up once again, in the true American spirit, to throw out the insiders, whether Democrats or Republicans, and elect an outsider. We need to explain to the world how in a free democracy those who have been injured by the wealthy and the powerful and yes, by the media, can seek redress, at the ballot box. And we need to explain to the world why this happened, and why this is the heart of a free democracy. Excerpts of a Nov. 30, 2016 speech to the Broadcasting Board of Governors by Powell, president of the Public Diplomacy Council and director of Washington Programs for the University of Southern California’s Annenberg Center for Communication Leadership and Policy. Trump is an accomplished demagogue, media celebrity, and reckless tycoon who has driven several businesses into bankruptcy. He may have been a outsider in terms of never having held public office before, but he was an insider in terms of pay-to-play political donations and networking with the rich and powerful, including the Clintons, who were invited guests to his third wedding. 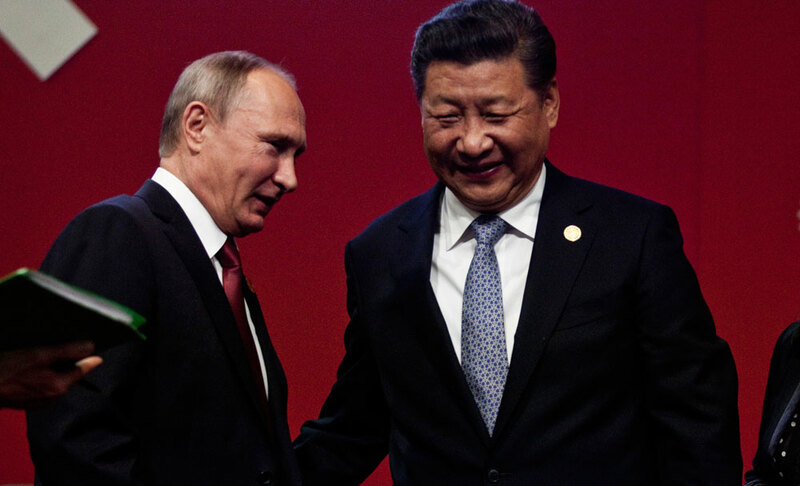 In the photo, Putin and Xi Jinping are laughing at their adversary USA's election of an unqualified demagogue as president, partly with help from Clinton haters in the FBI and Putin's FSB hackers, but it's uncertain who will have the last laugh. Trump won't stay in power as long as either of the strongmen Putin or Xi, and his successor may not be as easy for the strongmen to manipulate.